The world's greatest forest used to absorb greenhouse gases. Now, it may be emitting them. Top video: An aerial view of the Amazon forest. In a pristine patch of tropical rainforest in the central Amazon north of Manaus, a group of Brazilian scientists unloads boxes of heavy instruments from a truck and disappears down a thin path into the trees. As I walk with them, my clothes are instantly soaked from the humidity and a chorus of insects drowns out the sound of our footsteps. The forest is a tangle of leaves and vines competing for the little sunlight that streams through the thick canopy high above our heads. Half a century ago, the Amazon covered an area about the size of the lower 48 United States. Since then, more than 16 percent of that area has fallen to loggers, miners and land-grabbers. Direct human impacts like these have long defined the battle to save the rainforest. But Carlos Quesada, with Brazil’s National Institute for Amazonian Research, says a new threat is now looming. This is the first in a four-part series, The Amazon's Carbon Tipping Point. Day 1: The Amazon used to be a hedge against climate change. Those days may be over. “The forest is responding to the atmosphere,” he says. And the atmosphere is changing. Chainsaws and cattle are still eating away at the forest’s perimeter, but carbon dioxide coming out of tailpipes and smokestacks thousands of miles away is altering tropical forests on a much larger scale. Brazil holds one-third of the world’s remaining tropical rainforest and until recently it absorbed as much CO2 pollution every year as the amount produced by all the cars on the planet. Now scientists fear that deforestation and climate change are pushing the forest to a tipping point beyond which it will actually release more CO2 into the atmosphere than it captures. Forests just like this one. Quesada and his colleagues head farther into the forest to explain. The first research plot we reach looks almost like an emergency room for the forest. 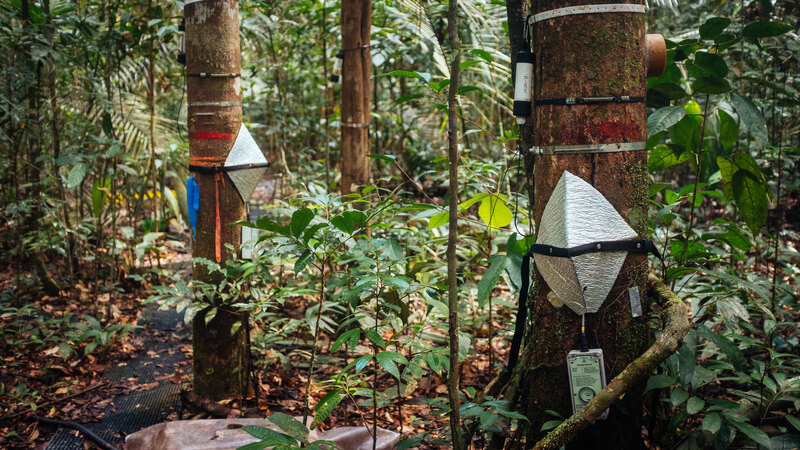 Every tree is laden with wires and sensors, instruments, brightly colored nylon ribbon for the purposes of identifying and measuring everything from photosynthesis and evapotranspiration rates to tree growth. Scientists from Brazil’s National Institute for Amazonian Research say this research plot in the Amazon north of Manaus is the most studied patch of tropical forest in the world. Instruments wired to trees record real time data on everything from evapotranspiration to tree growth. We climb up a 130-foot aluminum research tower toward the canopy. Halfway up, research assistant Juliane Menezes sets up a key piece of equipment called an infrared gas analyzer. She carefully places a living leaf, still attached to the tree, inside a red, glowing chamber, pushes some buttons, and the machine pumps higher concentrations of CO2 onto the leaf’s surface. “Then we take the measurement and download all the measurements of the day into our computers to model the photosynthesis,” she says. Plants use photosynthesis to turn CO2, or carbon dioxide, into food. And there’s a lot more of it in the atmosphere these days. Over the last 200 years, humans have pushed CO2 levels higher than they’ve been in almost a million years. This experiment is basically tracking, at a micro level, what that means for the world’s tropical forests. Research towers in pristine Amazon forest allow scientists to access every layer of the tree canopy in order to document the forest's carbon cycle and how it’s changing. Scientists use an infrared gas analyzer to measure how a living leaf responds to high CO2 concentrations pumped onto its surface. The Amazon’s sprawling forest, nearly the size of the lower 48 United States, stores an estimated 150 billion to 200 billion tons of carbon. Scientists worry that a potential die back of the Amazon triggered by climate change and deforestation would start releasing much of that carbon into the atmosphere. Quesada says all of this extra CO2 is causing global temperatures to rise on the one hand, “but on the other,” he says, “high CO2 can also stimulate growth.” Growth in trees like the ones we’re standing among. And for years, that’s what’s been happening. The Amazon and many other forests have been absorbing a lot of that extra CO2 and converting it into leaves, branches and trunks. Essentially capturing and storing pollution that would otherwise heat up the atmosphere even more. Quesada says until recently, the Amazon was hungrily absorbing the equivalent of the CO2 pollution from every car on the planet, every year. But even a huge forest like this one can only capture so much more CO2 before it reaches other biological limits. And Quesada says the Amazon appears to have done that, and stopped sucking up extra CO2. In fact, a few years back, for the first time on record, it actually released more carbon than it absorbed. It flipped from what’s known as a “carbon sink” to a source of carbon. Which, Quesada says, presents a frightening scenario. “The Amazon was buying you some time that it is not going to buy anymore,” he says, because once that environmental service of absorbing extra CO2 from the atmosphere stops, all that extra carbon will instead accumulate in the atmosphere, driving global temperatures even higher at a much faster rate. “We will really start to feel it,” he says. And Quesada says that’s just here, in pristine forest. In Brazil’s so-called “arc of deforestation,” along the southern and eastern edges of the forest that mark the advance of logging and agriculture, the impacts are much greater. He says all those activities usually bring fires, as well. And then there’s the impact of climate change itself. “So, you imagine on top of this, a future climate that is drier and hotter. So, this could really be a tipping point in the future of the Amazon,” Quesada says. A tipping point for the Amazon’s ability to absorb that extra carbon from the atmosphere, and, possibly, for the Amazon itself. A terrifying runaway climate change scenario laid out in the so-called “Hothouse Earth” paper, published last August in Proceedings of the Natural Academy of Sciences. 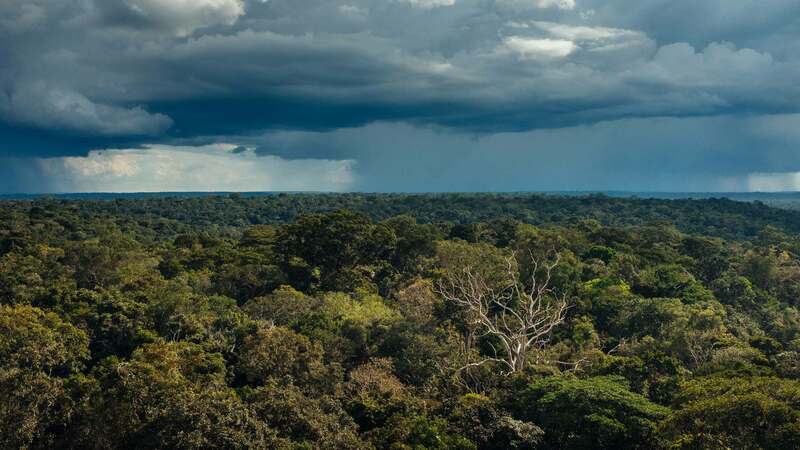 "Nobre and his colleague, Thomas Lovejoy, of George Mason University, have determined that the combined effects of deforestation, fires, hotter, drier temperatures and increased CO2 in the atmosphere are pushing the Amazon system to the brink. He says if deforestation continues at its current pace, more than half of the Amazon could begin to die off, releasing massive new amounts of carbon into the atmosphere. "“So not to really take any risks, not to take the risk of exceeding some of these tipping points, we advocate that deforestation should not exceed 25 percent,” he says. "That 25 percent threshold doesn’t leave a lot of wiggle room. And by many accounts, deforestation here is still rising, even accelerating. But Nobre says it’s crucial to put on the brakes if we’re going to meet the Paris climate agreement’s target of limiting global warming to 1.5 degrees Celsius to avoid the worst effects of climate change. At Carlos Quesada’s Amazon research plot, he says this is the time when science matters more than ever. But Brazil has been struggling through an economic crisis, and the budget of the entire National Institute for Amazonian Research has been cut by almost half. Quesada is hoping to install circles of giant towers around patches of forest here and then blow a constant stream of higher CO2 concentrations over the trees to mimic future conditions. He says understanding how these forests will react to high CO2 is critical to predicting the Amazon’s impact on climate change, good or bad. “It's like a glimpse of what the atmosphere will be 50, 100 years from now. To understand if you still have forests later on or not,” he says. 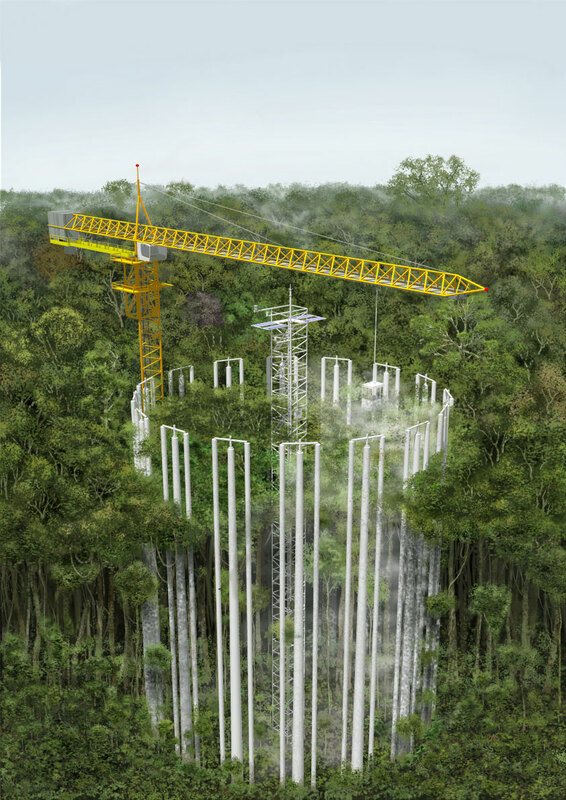 An artist's rendering of Carlos Quesada’s proposed experiment to install circles of towers in pristine Amazon forest that would blow a constant mist of higher CO2 concentrations over the forest. The project has not received funding. Knowing this now could give Brazil, and all of us, time to plan ahead and adjust our ways of life. Quesada says building those towers here and running experiments over the years would cost somewhere in the range of $15 million, a small investment that would answer arguably one of the biggest questions facing humanity — can we save the Amazon, so it can help save us? But for now, he and his team continue to do their research on a shoestring budget, measuring the forest’s response to climate change one leaf at a time. 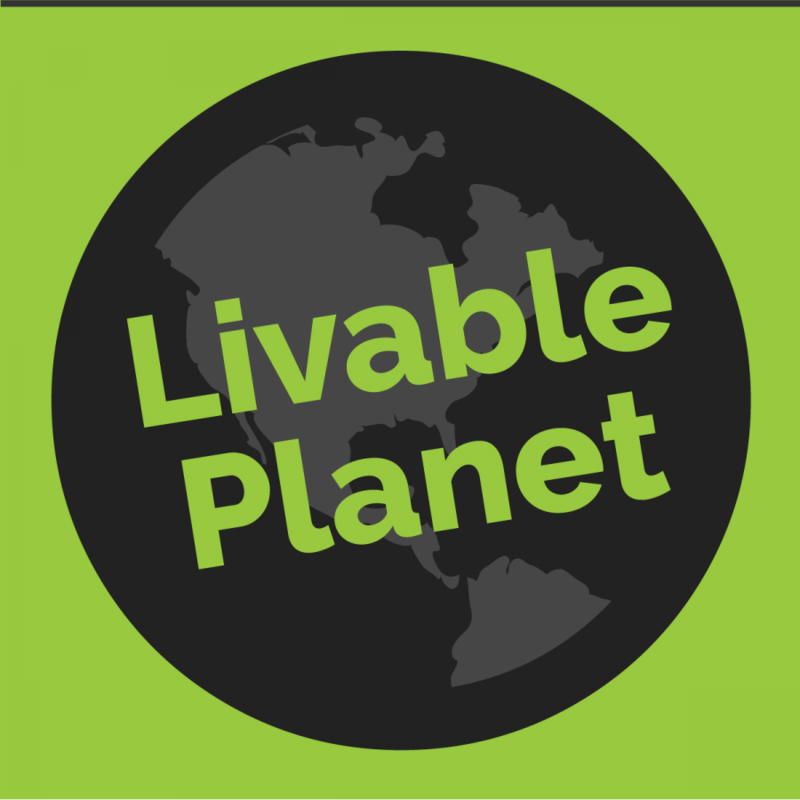 In Science, Tech & Environment Science Climate Change Environment Technology Liveable Planet The Amazon’s Carbon Tipping Point. Tagged: climate change Brazil Amazon carbon.